Robert Neumark Jones has been cast in the role of Jesse and Asha Reid has been cast as Alex. Three-time Edinburgh award winner, Robert recently toured the UK in King Arthur and starred in John Cleese’s Bang Bang. Asha most recently worked with Stephen Laughton in his play The Biggest Tarantino Fan in the World at Vault Festival earlier this year. Other credits include Scarlet at the Southwark Playhouse, Hacked at Theatre503 and Electra at the Old Vic. Sarah and Georgia most recently worked together on Alkaline at the Park Theatre, which earned Georgia an Off-West End Theatre Award nomination. Georgia’s other credits include If We Got Some More Cocaine I Could Show You How I Love You at the Old Red Lion, Rails at York Theatre Royal and Cans at Theatre503. The play, which explores rising anti-Semitism in the UK, has already caused controversy when it was met with anti-Semitic responses and the posting of Palestinian flags following its announcement on the eve of Kol Nidre – a festival marking the start of Yom Kippur, the holiest day in the Jewish calendar. A few weeks later a far-right Jewish group attacked the playwright for his attempts to open a peaceful dialogue around the themes of the play and his support for a Palestinian State. 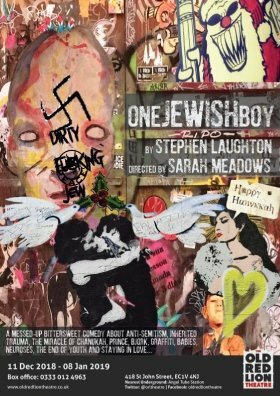 With the shadow of hatred festering at its very core the play is a bittersweet comedy fuelled by anti-Semitism. Told out of chronology – it asks if the fear of hatred, could be even worse than hate itself.